Established in 2014, Hop N Moose is the relative ‘new kid on the block’ of Killington-area brewing companies. Located in the center of downtown Rutland, VT – just a ‘hop’ (and a skip) from the Killington Mountain Lodge – this large, casual bar and restaurant offers its own beers on tap, as well as bottled brews, wine and liquor. The house-brewed beers all have fun names, such as the ‘Bomosseen Brown,’ ‘Salty Caramel’ and ‘Swamp Donkey Stout.’ They even brew a few ciders and craft root beer on site. (Kids, or kids-at-heart, can order a craft root beer float for dessert.) Can’t or don’t imbibe? You’ll still feel right at home in this establishment, where even water is served in a tall Pilsner glass. Think of this as a fun, casual hangout spot – with high-top and regular tables, outside seating and big screen TVs over the bar with the ball game on. 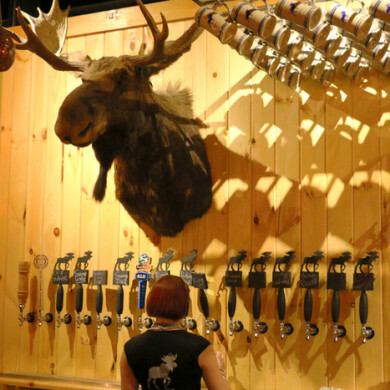 The decor features plenty of taps and even beer kettles in the dining room, and true to its name, a giant moose head looming above the draft beers. There’s a floor-to-ceiling chalkboard wall where specials are posted in swirls of colorful talc. You’re bound to make new friends in this downtown bar. The food menu rivals the brews – featuring burgers, wood-fired pizzas and sandwiches to eat in or take out. We don’t know if you’ve noticed, but cheese is on the menu everywhere you go in Vermont – and it’s always noted which farm it comes from. To that end, start with the Vermont Cheese + Crackers plate. In the mood for something heartier? The burgers are fantastic, all handmade with grass-fed beef from local Hathaway Farms. We suggest the Classic with lettuce, tomato, Cabot sharp cheddar and North Country Smokehouse applewood smoked bacon. Delish. It’s fun to sit at the bar here, because it’s the kind of place where you feel comfortable talking to the people around you. No one’s a stranger at Hop N Moose, and they like it that way. So order up a pizza from the wood fire oven and a craft beer from the tap, and soak up the Vermont culture. From the chill atmosphere to the great menu, the cool T-shirts to the live music, you can cut loose at Hop N Moose. Hop N Moose is located at 41 Center Street in Rutland, VT. For more information, check out the whole menu on the Hop N Moose website or call (802) 775-7063.